I always wanted to dress my baby girl in big, obnoxious hair bows. I mean, I’m from Texas, so the bigger the bow, the closer to God, right? Or something like that. Anyway, now that Wrenn’s actually here, I’ve found it hard to find bows that I really love. All of them look the same, and it’s really important to me to only dress her in things that are comfortable for her. I love the little ruffle, and considering the size of my fabric stash, there are limitless possibilities. And, since we tend to dress her in basic mix and match pieces, those bows add just the pop of color to finish off her look. 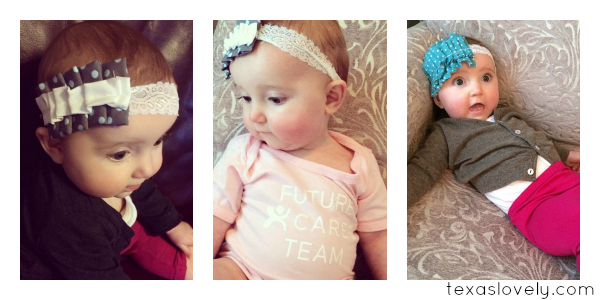 It’s never too early to raise a baby fashionista. I’ve added some bows to my shop so that others can enjoy beautiful, affordable hair accessories. They’re made of the highest quality fabrics, and the headbands themselves are either stretchy lace or half-inch elastic, both of which are more comfortable for little heads than that tiny elastic, which tends to leave dents on foreheads. No need to teach them the price of beauty until they’re old enough to wear heels and spanx, am I right? 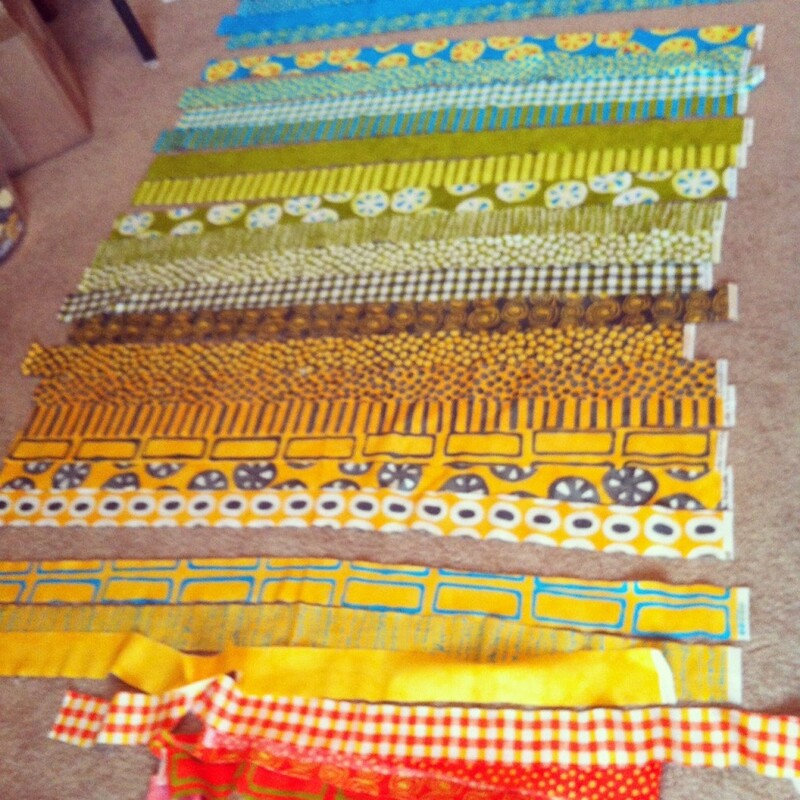 All bows are sized to order, and I can make them fit anyone from a newborn to an adult. Shipping is free, and if you want to order four or more, contact me through my shop and I’ll be happy to provide a price break. I’ve already given them to several baby girls in my life as gifts. And, of course, Miss Wrenn has one of everything, because I would never sell something that I didn’t love enough to use myself. 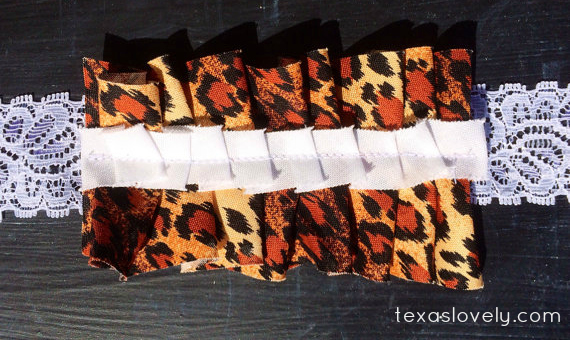 This leopard print bow is one of my absolute favorites – and let’s be honest, it matches some of my favorite shoes. Go visit my shop and stock up on baby shower gifts! I can’t wait to see pictures of adorable baby models enjoying their lovelies. 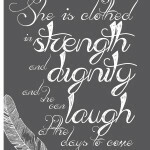 Looking for beautiful scripture prints to inspire you? 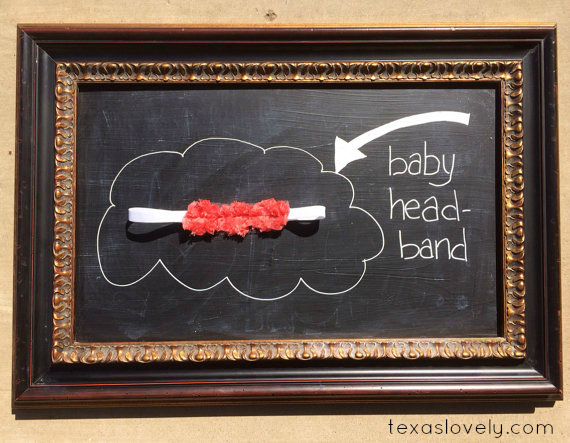 Visit Texas Lovely on Etsy. 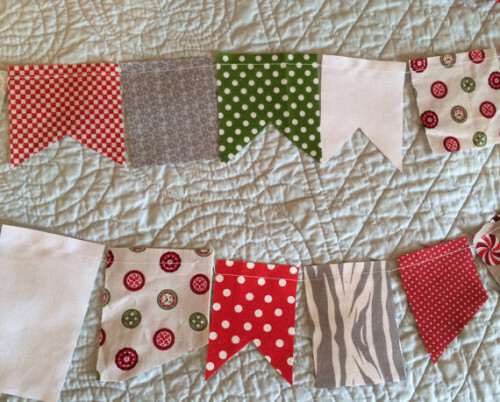 Christmas Bunting – In the shop! I’ve got brand-new Christmas bunting in the shop, and I’m offering free shipping for the next few days. 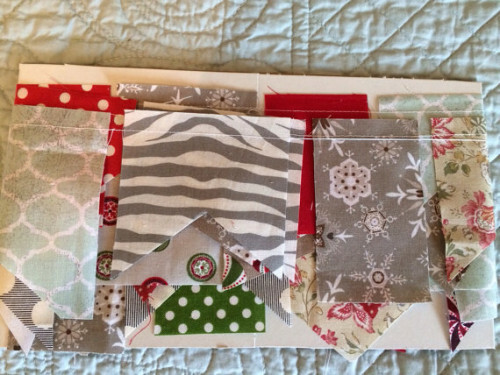 It features some of my favorite Christmas fabrics without being TOO Christmas-y. I mean, nothing says Merry Christmas like a little gray zebra print, right? This makes me so excited to decorate for Christmas. 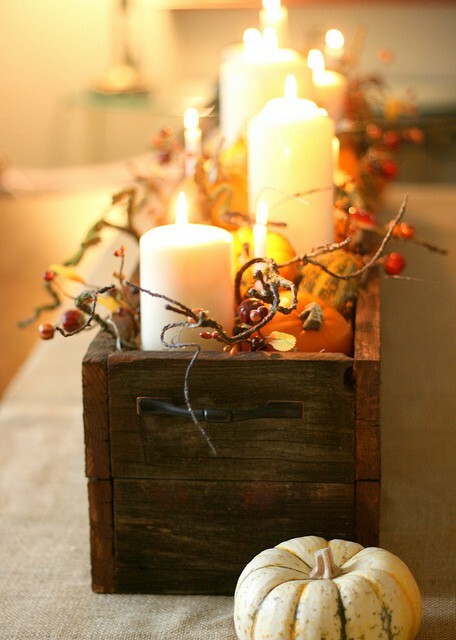 When do you start your decorating? I like to have mine up by the weekend before Thanksgiving, because that way I can enjoy Thanksgiving and my time off work and not run around working on things. I realize there’s those “nothing ’til after Thanksgiving” purists, but I’m not one of them. My biggest goal is to be able to relax and enjoy being at home with my family. I keep thinking back to last year’s Thanksgiving. I found out I was pregnant the Tuesday before Thanksgiving – Nov. 20 – which was also just two days before my birthday. That week was so special (and stressful – I was high risk and in the ER the day we found out I was pregnant), and I keep reliving those moments over and over while staring at my beautiful baby girl. I knew all along she would be amazing, but really, I had no idea. So this year as I decorate for Christmas, I’m going to be extra thankful, and joyful. My little family has been so blessed. This weekend, the theme was REST. Since I was at a conference last weekend, I basically worked 12 days straight without a day off. Add to it that much of those first 5-6 days I was feeling pretty sick, which meant my energy level was lower than normal, and a 13-hour day Thursday, and by Friday evening I was pooped. Luckily so was Mr. Right, so we did a LOT of sleeping. Like, 10 hours a night of sleeping. Like, we went to bed at 8:30 every night. We are so wild and crazy. It was glorious. In between all that sleeping we managed to have some fun. 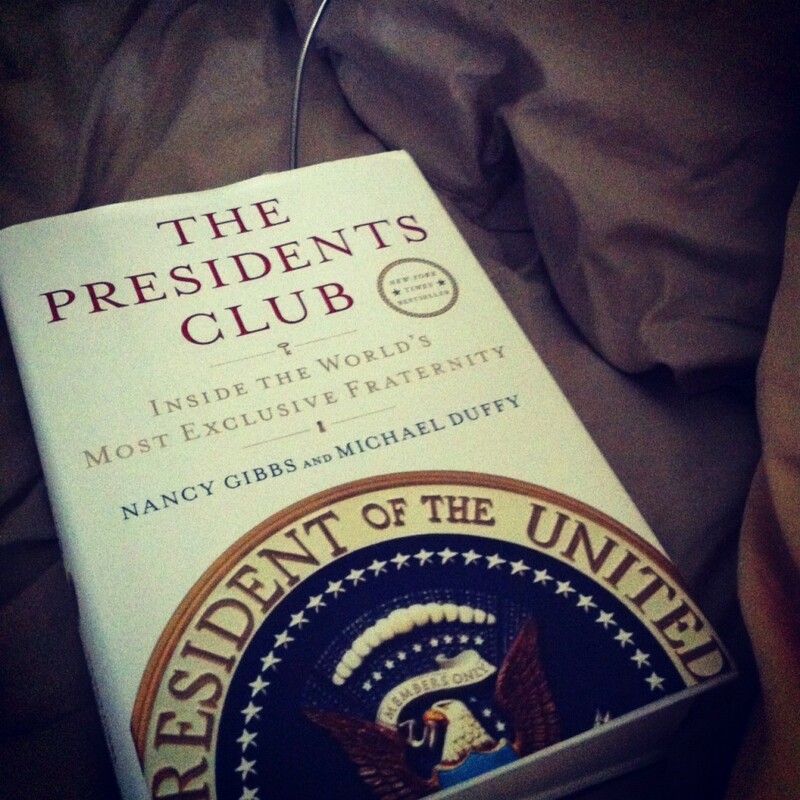 This is the book I’ve been reading. I adore biographies, and politics, and history, so this is like my book-loving trifecta. Friday night we went to a party at the home of the owner of Mr. Right’s new real estate company. The theme was “denim chic” and I must say I felt a little bit of pressure to look effortlessly, casually chic. Coupled with the fact that it was 90 degrees in late October and my hair was a greasy mess, my skin looked tired, and, well… I may or may not have tried on every outfit in my closet. So silly of me, because we sat down the entire time we were there, nobody was dressed up, and I don’t think a single guest gave my outfit a second glance. We left the party for dinner with my mom, sister, her husband, and the real star of every family get-together, my nephew Luke. These pictures are actually from the night before when we babysat him, but if you’re anything like me, you’ll take baby pictures whenever/wherever they’re available. Mr. 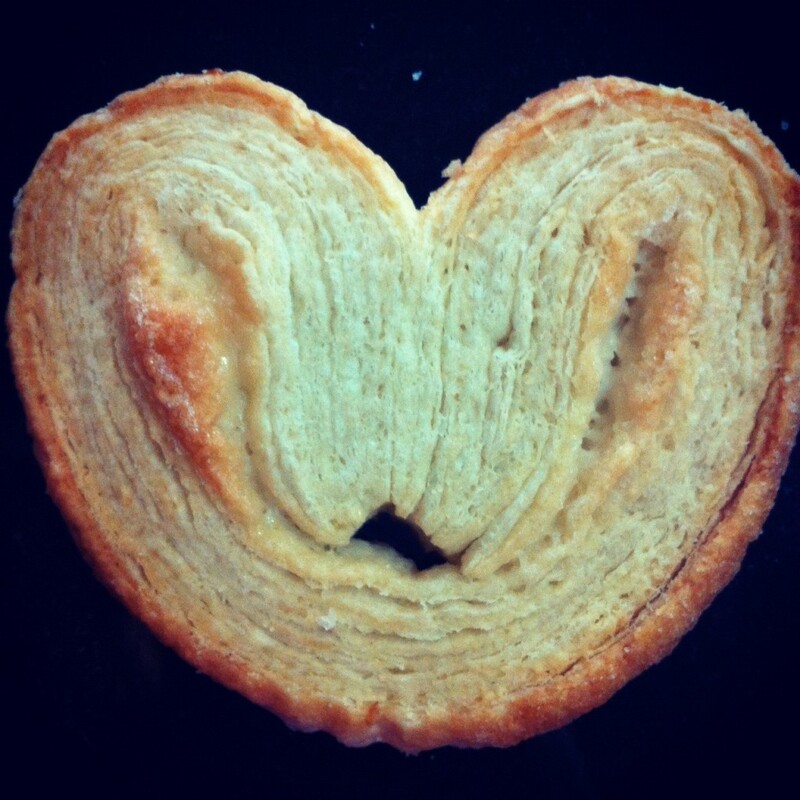 Right got me a special treat after my long week – special heart cookies from Trader Joe’s. The fact that his office is within walking distance of my favorite grocery store may turn out to be the best thing – or the worst thing – that ever happened to me. I see a lot of gourmet organic treats in my future. Saturday I spent the entire day in my pajamas sewing. It was wonderful. I realize not everybody would love to spend a pretty day stuck indoors on their hands and knees on the floor, trying to keep from getting stuck in the foot by a rogue strait pin, but for me, it’s the ultimate escape. I use the time to catch up on all my favorite shows, and my mind gets to be creative and messy for hours without interruption. 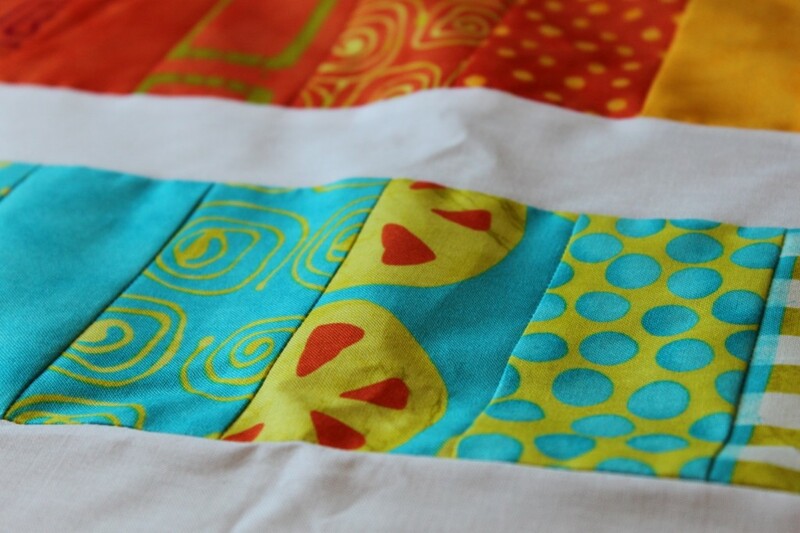 So, long story short, come back Wednesday for some pretty quilt pictures AND an update on a special pillow I’m making myself. Saturday night Mr. Right and I had a hot date thanks to a gift card we won in an internet contest (score!). No pictures because we were too busy making googley eyes at each other. Sunday we went back to our home church for the first time since Mr. Right left their staff in early September. It was so nice to sit together during worship – something we haven’t done at this church in over a year because he had to work every service. I also got to finally introduce him to our Sunday School class – I think a few people were wondering if that phantom husband of mine really did exist, but I got to show them that not only does he exist, but he’s a total hottie. 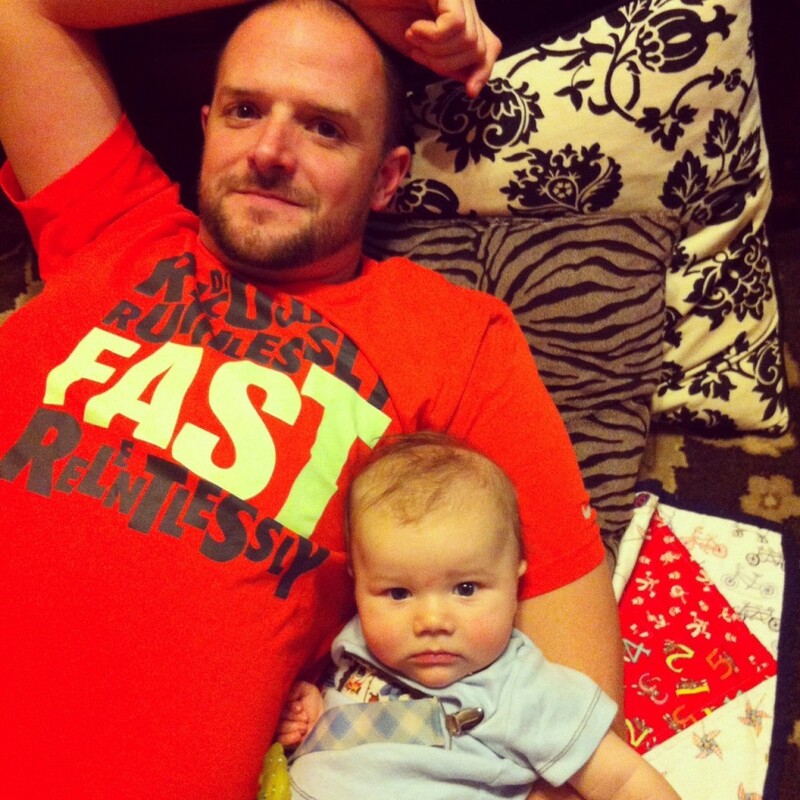 Next week’s wrap-up will be epic… I get to meet my newest nephew in person! I am so excited I can barely stand it. Never fear, there will be PLENTY of pictures of that precious moment. 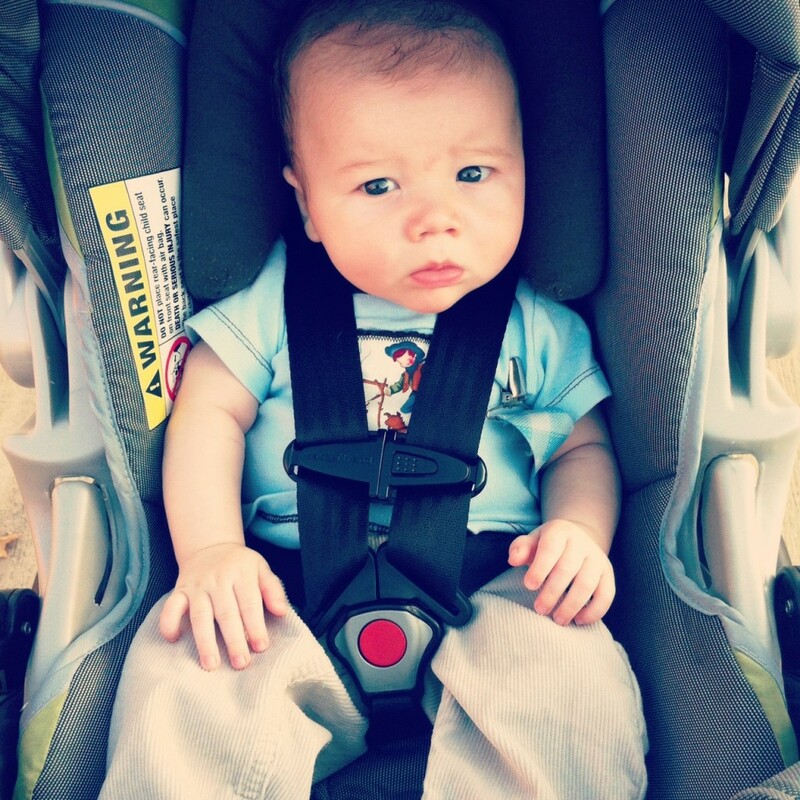 I am linking up Sami, Dana, and Leeann for their weekend updates. Want to join me? Today I’m linking back up with the Bargain Blonde for a Friday Favorites feature. Want to join me? Just leave a link to YOUR latest online favorite down in my comment section. I always love to get new ideas! To see the original source (and some great tutorials) just click on the picture. 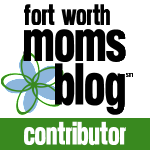 I believe in giving credit where credit is due! I don’t have a lot of free time at the moment (that’s what starting a new business will do to you – but I LOVE it). 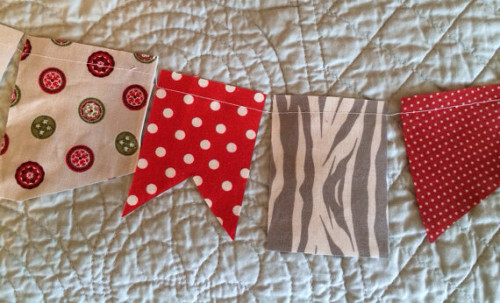 But, someday soon I plan to learn how to make baby bibs so I can stock up on some baby shower gifts. 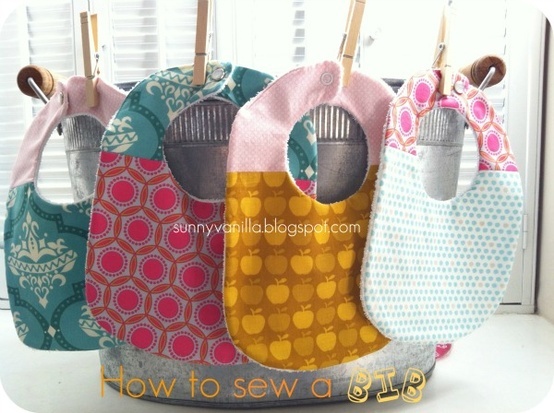 I liked this tutorial, although I also went ahead and just bought some bibs hoping I can deconstruct them and make my own pattern. I’m kind of a rebel like that. My internet friend Lauren is wonderfully creative, and she came up with this idea for an invitation. 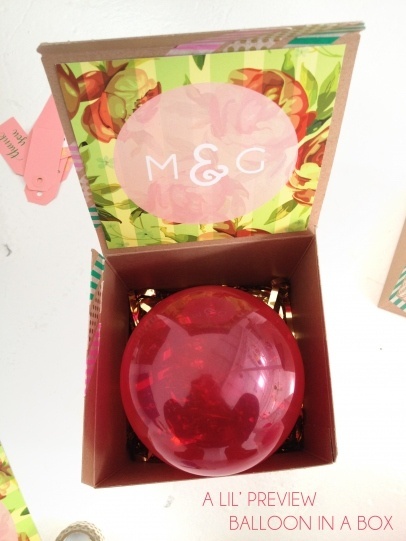 I’ve done boxed invitations before and got raves from my guests over them, but this one is even better! 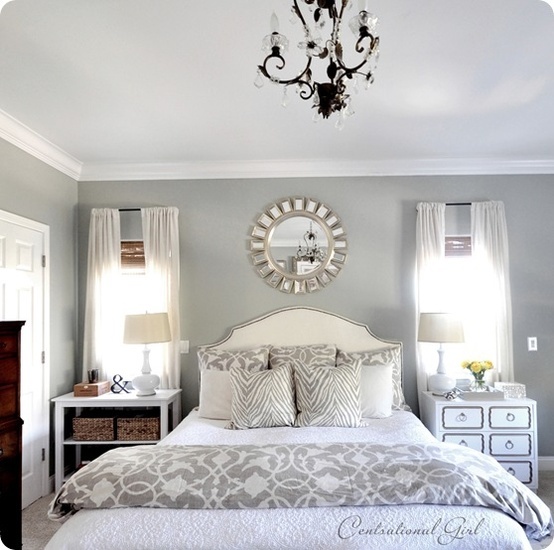 I love gray, I love neutral bedrooms, and I love that mirror. I could have some sweet, sweet dreams in that bedroom. Somehow I married a man who can build just about anything I dream up, and as soon as I saw this wooden box I showed it to Mr. Right, and he has assured me he can make me one. I think it would be great for any season on our old barn dining table. 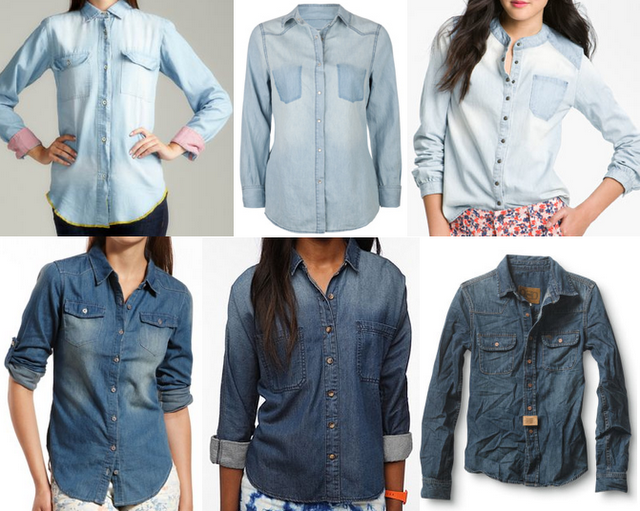 I love my chambray shirt that I snagged on clearance at the J Crew outlet, and I love this fashion blog by what seems like a really nice Christian girl. 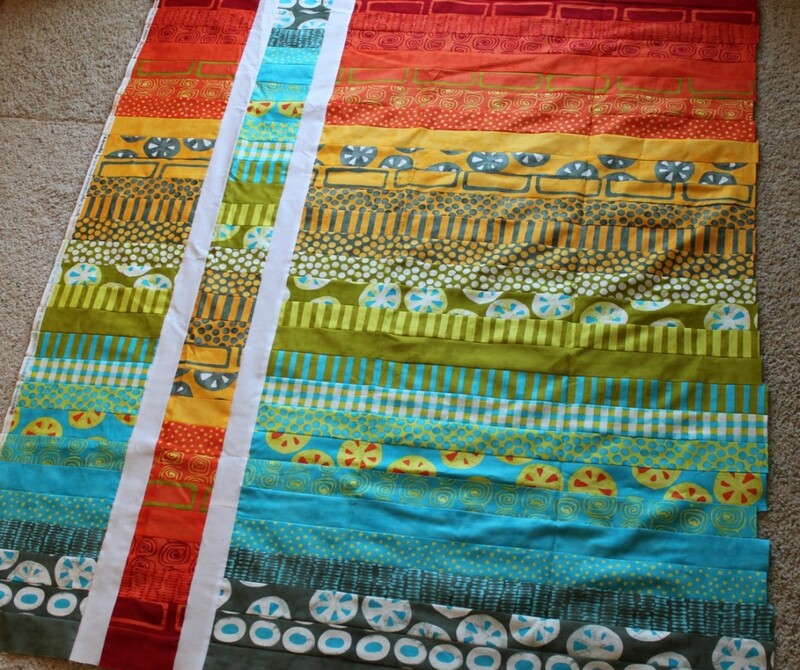 And finally – I have discovered this blog which also has this etsy shop. 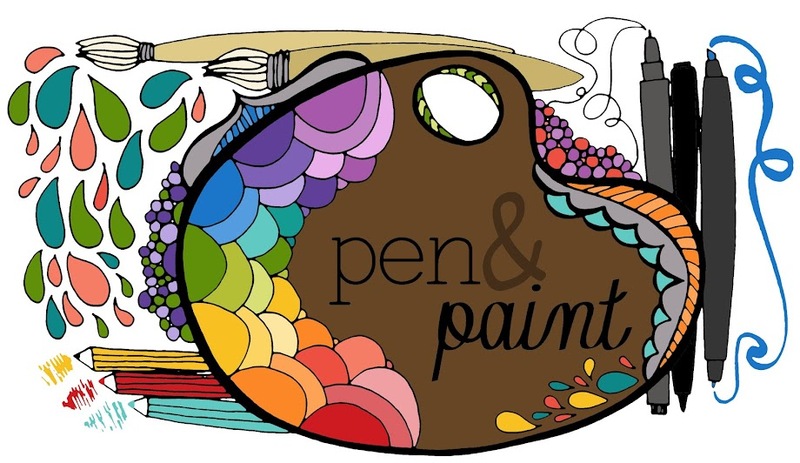 Oh my word, this gal hand-draws all of her artwork, and I am amazed at her talent. It’s like all the doodles I used to do in school, the only difference is that hers are gorgeous, and mine looked like doodles. 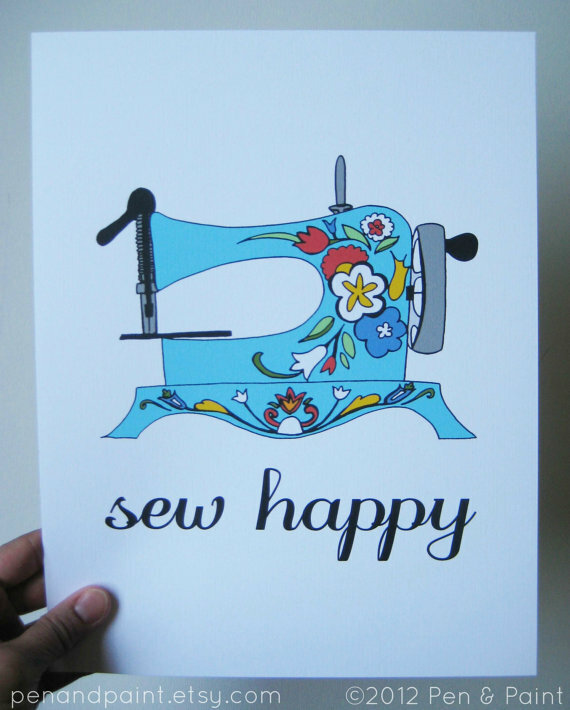 I love it so much that I bought two of her pieces – this sewing machine print will soon hang in my sewing studio. 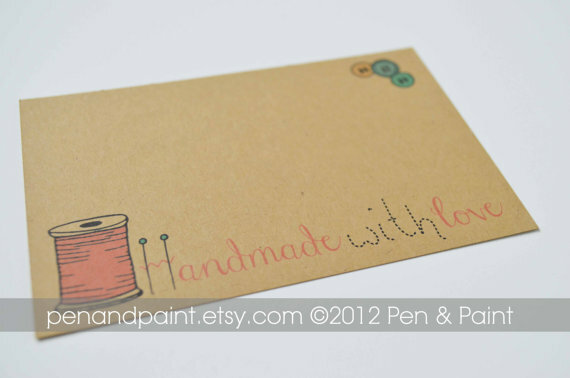 I bought these cards, which will go in my new orders, so if you visit my shop, you’ll be seeing this soon! I hope you have a WONDERFUL weekend filled with all things lovely and relaxing! 1. 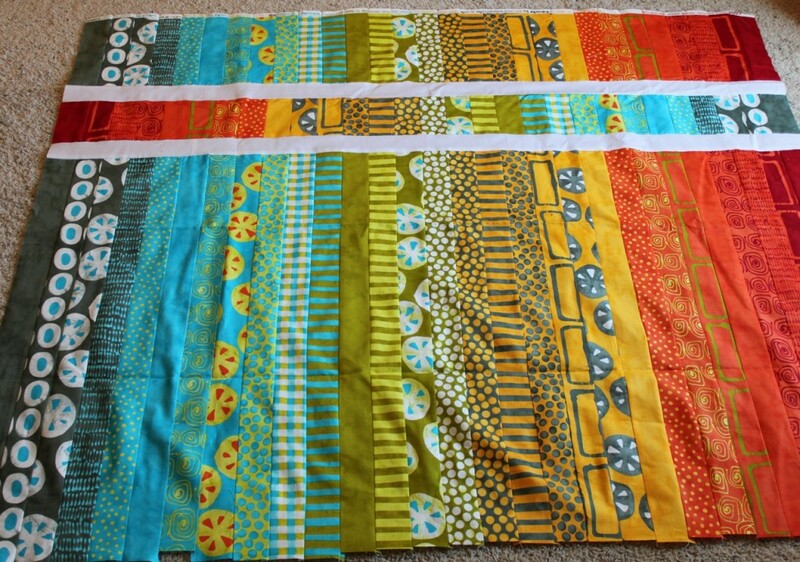 I cut my squares 6 x 6 inches, which means for a 47 x 47 baby quilt, I use 100 squares. 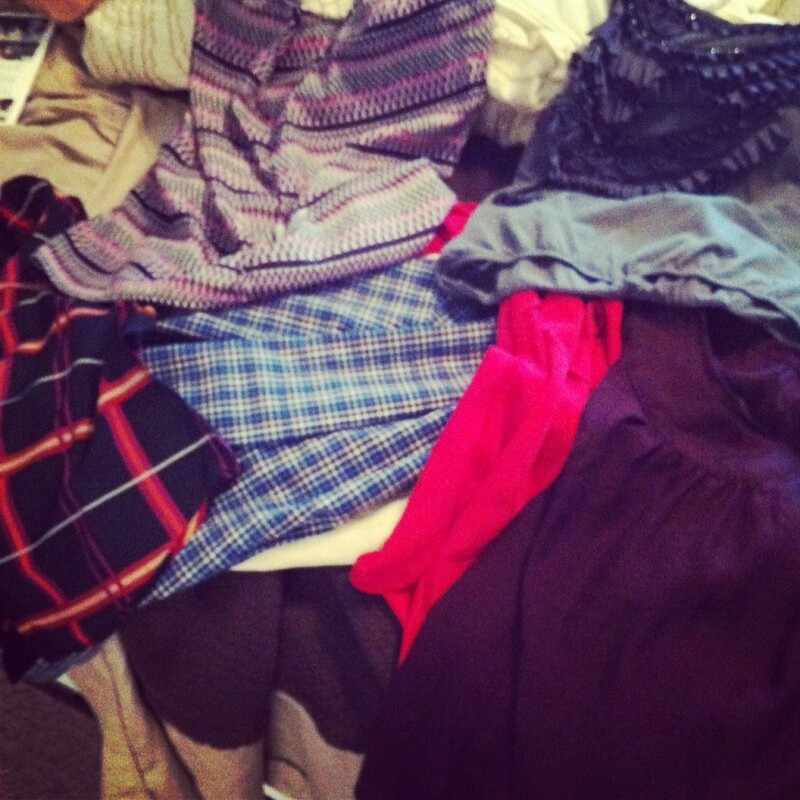 Now this varies, of course, based on my mood and the amount of fabric I have. Sometimes I add a border and use fewer squares. 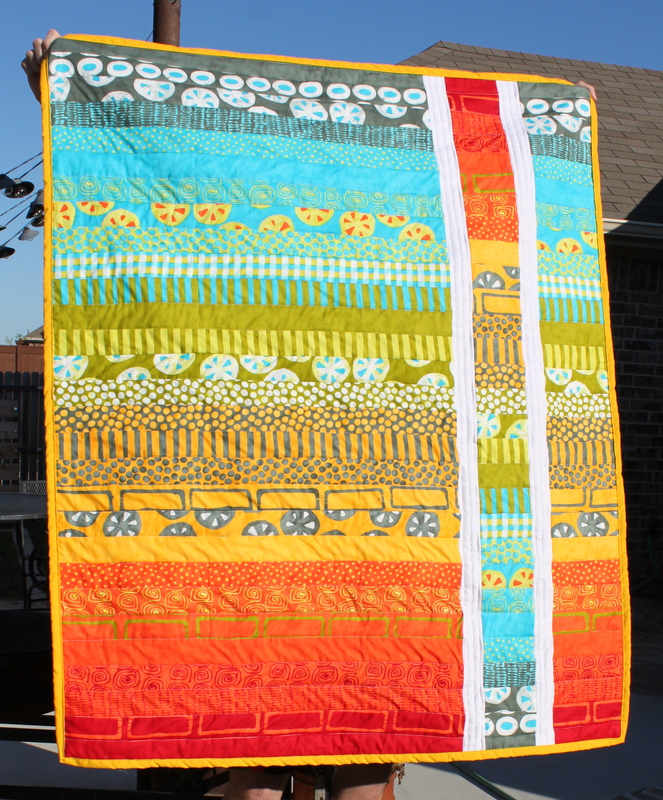 My ginormous blue chevron wedding quilt was FOUR times the size of my normal baby quilts, which made it a queen. (It was a beast, but so worth it for my tall friends). 2. 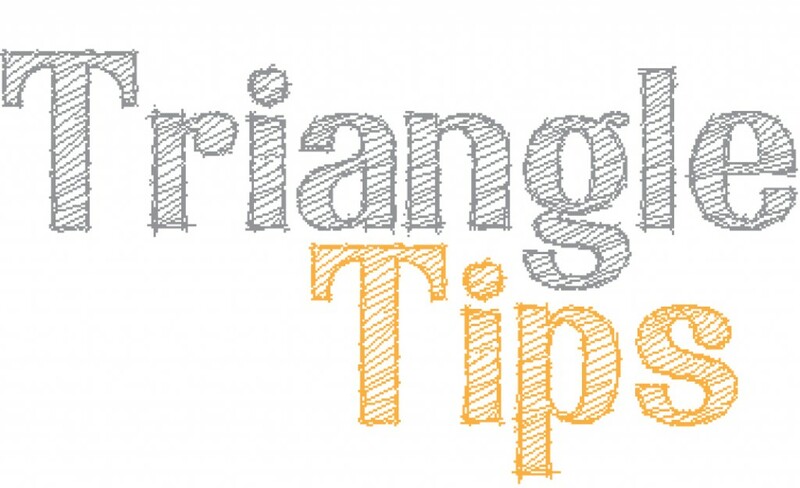 After I sew my two triangles together to make a square and press it flat, I simply clip the tiny leftover fabric on each corner (which makes another triangle), and keep sewing. 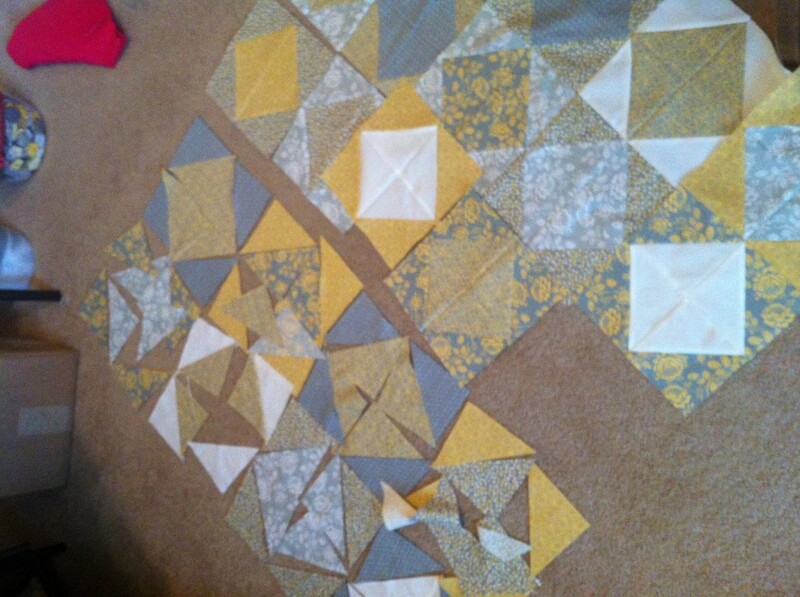 On my first triangle quilt I tried to re-trim every square to be perfect, but it was a colossal waste of my time. 3. 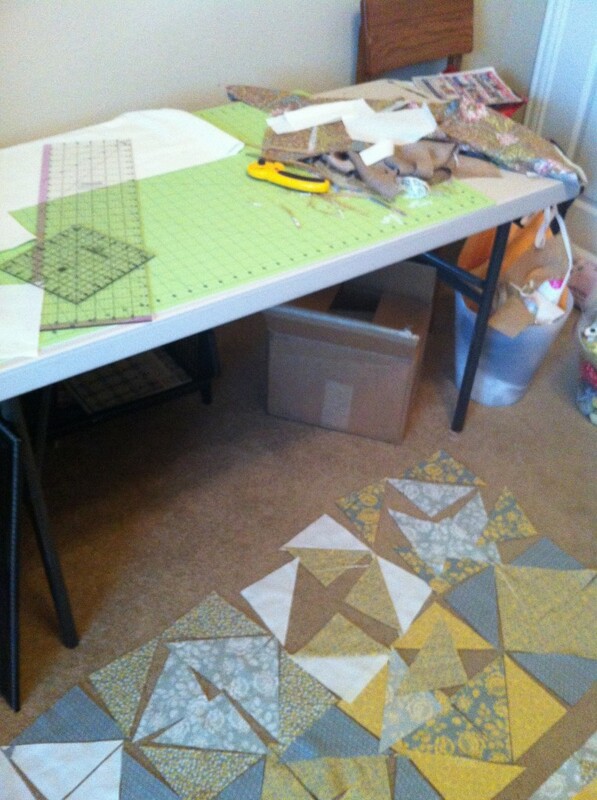 I use technology to my advantage – after I lay all of my triangles out on my floor to make my quilt pattern (which is a lot like putting a puzzle together), as I tackle each section I snap a photo with my phone. 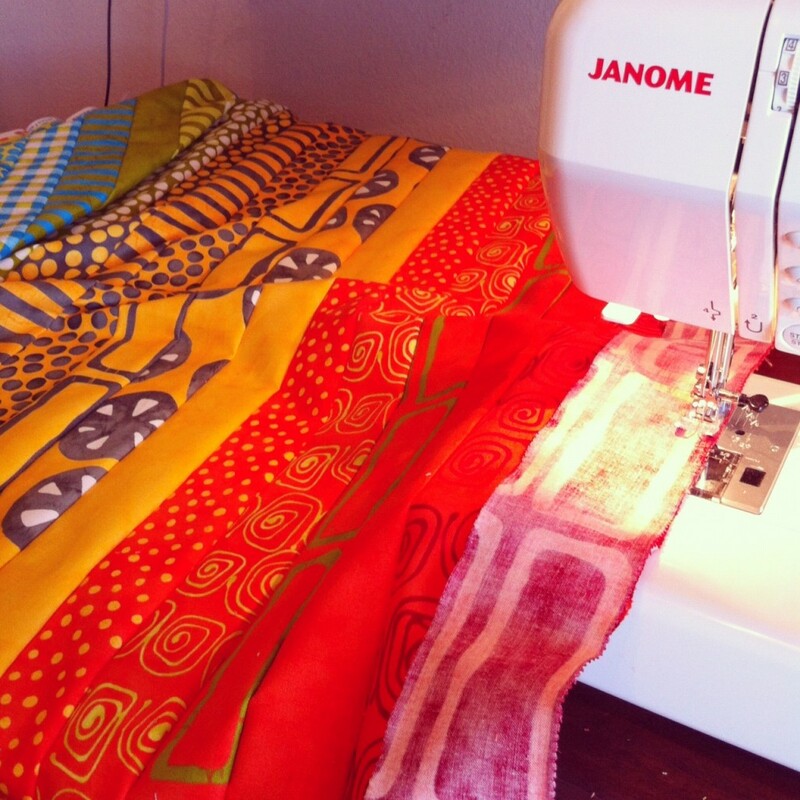 This allows me to work with a larger section of fabric at a time, and be able to refer back to the photo to know how to place the fabric. This comes in handy when you’re trying to remember, “Does this fabric or that fabric go on the inside diamond?” and saves you a few trips getting up and down off the floor. Of course, I still get on and off the floor (and up and down to the ironing board) about 8 million times in the course of a quilt, but it could be worse. 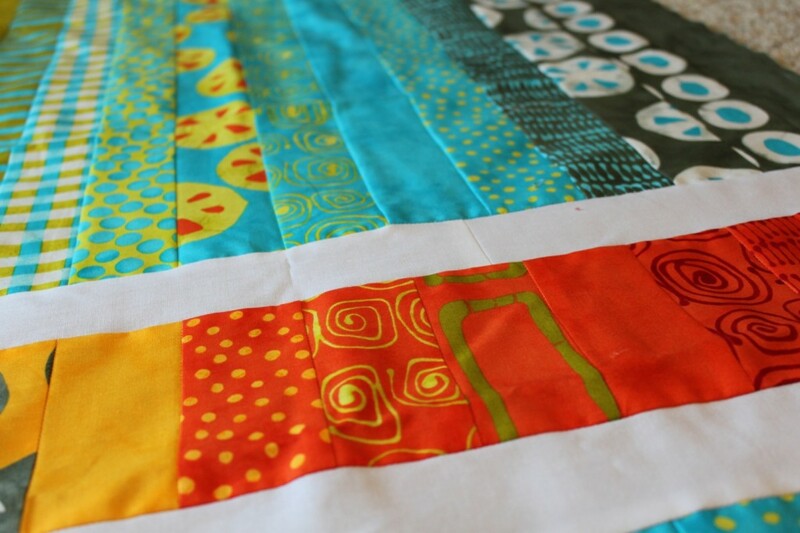 Who knew quilting was such good exercise? 4. 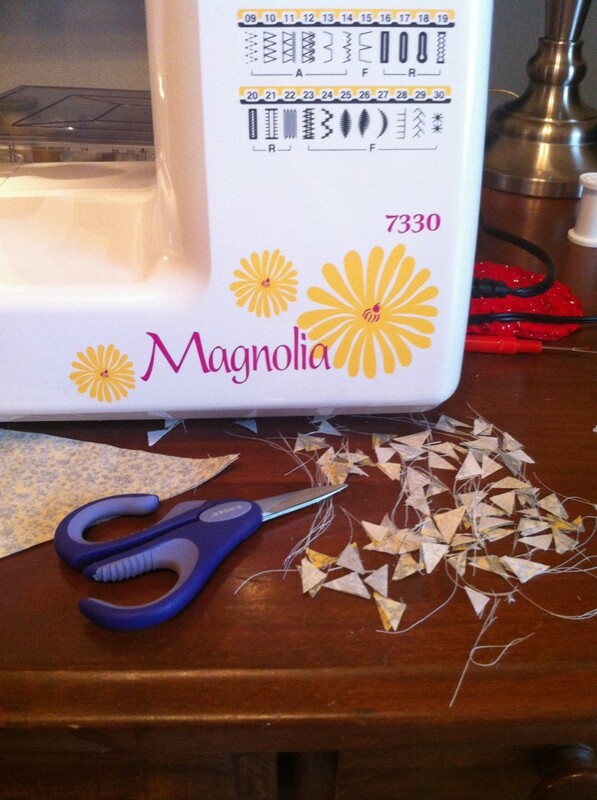 I always cut a few extra triangles, because inevitably I’m going to mess up and it’s a pain to go back and cut again after you lose the rhythm. Plus I’m really bad at math so sometimes I miscount. 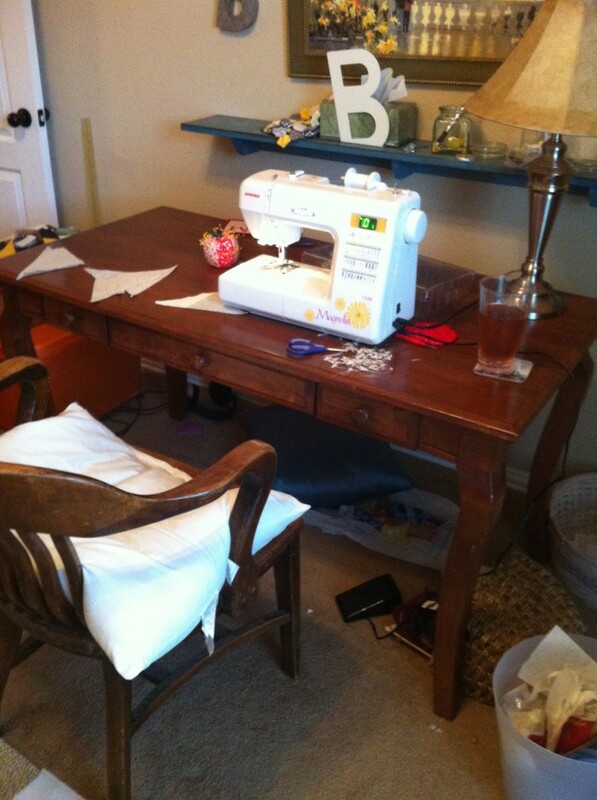 And alas, just in case you couldn’t tell with the other behind-the-scenes pictures, my sewing room gets USED when I’m quilting. Like, destroyed. And that’s okay, I kind of like it that way. I truly believe it’s impossible to be tidy during the creative process. 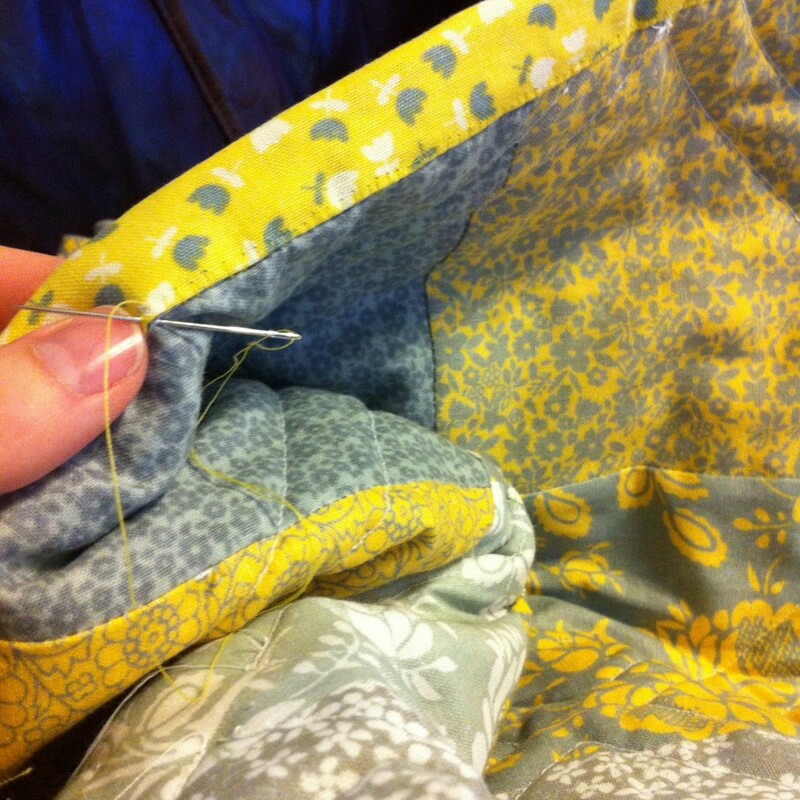 PS–Why yes, I do sit on an old pillow while I sew. That old wooden chair gets quite hard on the hiney when you’re quilting for eight hours straight. Keepin’ it clasy, my friends. Interested in getting your own lovely? 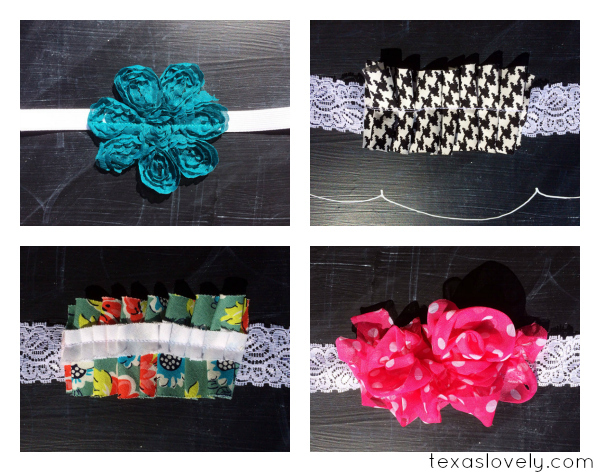 Visit my online shop, Texas Lovely, on etsy!